For true cyclists, few things replace the enjoyment and physical satisfaction of distance riding on outdoor trails or roads. But inclement weather often leads to unsafe or uncomfortable riding conditions, making indoor stationary bicycles or bike trainers good options for staying conditioned while sheltered from the elements. Both types of indoor exercises possess strengths and weaknesses. Exercise bikes are free-standing machines -- often with electronic gauges and resistance controls -- allowing cyclists to pedal away for miles without moving an inch. These often are found in gyms and health clubs as options for cardiovascular exercise. Bike trainers incorporate the same concept of stationary riding but allow cyclists to use their actual bicycles during the indoor workout. Trainers prop up the rear wheel of bikes and hold the cycles in one place for stationary riding. Exercise bikes come in two general varieties: upright and recumbent. Upright bikes require an upright posture similar to sitting on a real bike, with seats that raise or lower for proper height and leg adjustment. Recumbent exercise bicycles sit lower to the ground and require a somewhat reclined posture. According to Cycling-Review.com, bicycle trainers typically use one of three types of technology to simulate the wheel resistance of road or trail riding. Fluid trainers use hydraulic fluid that becomes thicker as it heats up, thus increasing resistance on the training wheel that rests against the tire through the duration of the workout. Wind trainers use a series of gears hooked to fans, creating resistance and producing more air flow with each tire rotation. These tend to be noisy. Magnetic trainers use a series of magnets that create tension on the resistance wheel, simulating riding on inclined surfaces. Most stationary exercise bikes have electronically controlled tension and difficulty levels numbering 15 or higher, according to Fitnessproposals.com. LCD displays allow constant monitoring of heart rate, distance pedaled and estimated calories burned. Some possess pre-programmed workouts simulating uphill, downhill and level riding conditions. 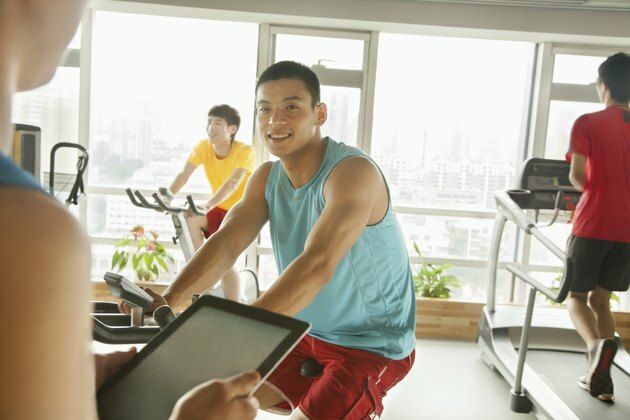 Bicycle trainers lack the electronic amenities of exercise bikes. Trainer users adjust tension wheels for simulating inclined surfaces by tightening knobs located near the trainer base and housing for the bicycle wheel. The top feature of trainers comes in the use of the actual cycles that riders use outside, making it the perfect training tool in the off-season. Exercise bikes and stationary trainers offer virtually identical health and exercise benefits, allowing for the same cardiovascular workout attainable on outdoor bicycles. Fitnessproposals.com notes that stationary cycling offers a workout for most of the body, including heart, lungs, abdomen, legs and upper body. Cyclists with chronic back discomfort often choose the reclined features of recumbent bicycles for riding, whether using stationary or road bikes. For upright stationary riding, protecting knees becomes a main concern. Bike seat adjustments that are too low don't allow for full leg rotations, and seats adjusted too high overextend the legs. Either extreme leads to exhausted, sore or even injured knees. Whether using a trainer or an exercise bike, adjusting the seat so legs are nearly straight with just a slight bend in the knees when feet are on the pedals maximizes comfort.